Definition: Vasculitis is also known as angiitis and arteritis that is a group of disorders that destroy blood vessels by inflammation. It causes changes in the blood vessel walls, including thickening, weakening, narrowing or scarring. These changes can restrict blood flow, resulting in organ and tissue damage. Vasculitis is primarily caused by leukocyte migration and resultant damage. The specific blood vessels affected include arteries, veins, and the tiniest of these known as capillaries. It can affect different parts of the body, leading to a wide range of symptoms. Each of the vasculitis diseases is defined by certain patterns of distribution of blood vessel involvement, particular organ involvement, and laboratory test abnormalities. As a group, these diseases are referred to as vasculitides. 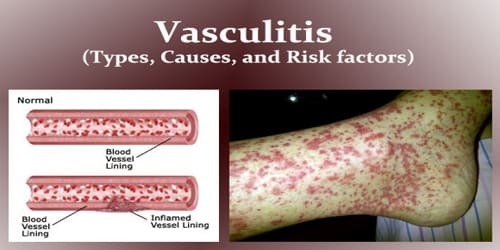 The word vasculitis is derived from the Latin “vasculum”, vessel + “- itis,” inflammation. Another term for vasculitis is angiitis. When arteries are the inflamed blood vessels, the condition is also referred to as arteritis. When the veins are inflamed, it is referred to as venulitis. 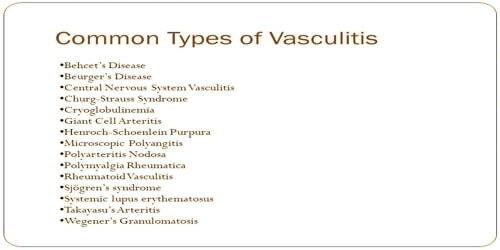 Types of Vasculitis: Vasculitis can be classified by the cause, the location, the type of vessel or the size of the vessel. Causes and Risk factors of vasculitis: The actual cause of these vasculitis diseases is usually not known. However, immune system abnormality and inflammation of blood vessels are common features. Each form of vasculitis has its own characteristic pattern of symptoms, much of which depends on what particular organs are affected. Vasculitis also may occur with infections, drugs (cocaine, amphetamines), cancers, lupus, and rheumatoid arthritis.